It’s been a crazy few months of travel, from backpacking in Iran to visiting my home town again to doing travel Podcasts and there have been way too many highlights to mention. 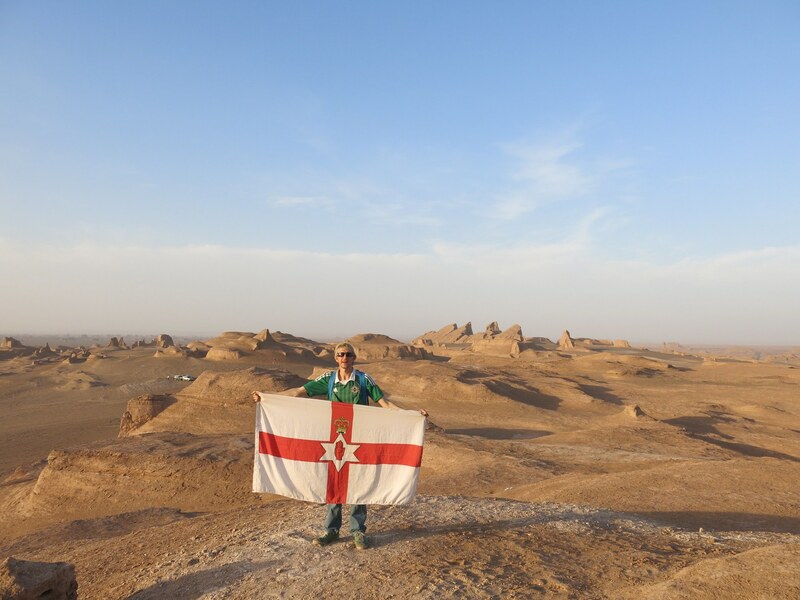 When in Iran, you can’t miss a visit to the desert. 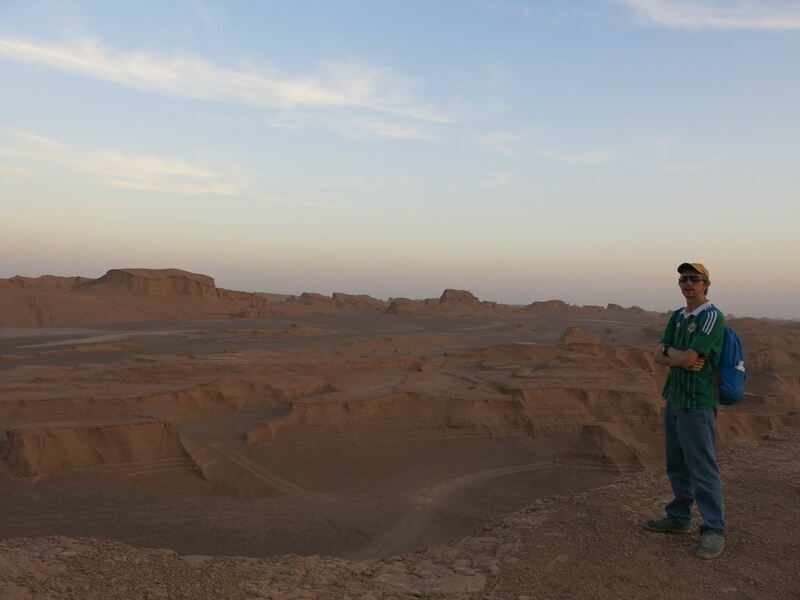 Iran has lots of desert areas and we’ve toured a few of them. One of the spectacular places to watch the sun go down is the Kaluts desert. The Kaluts desert is best reached when you are staying in the city of Kerman in South Eastern in Iran. Backpacking in Iran is not the easiest place to organise tours etc., (due to language problems and lack of tourism infrastructure mostly) but the Kaluts desert tour is for sure one to get on your list. 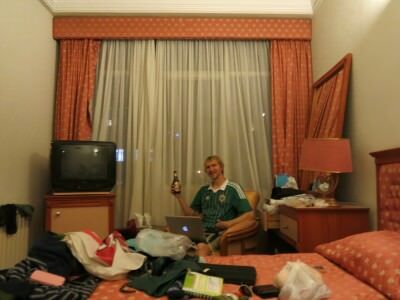 Relaxing in Kerman in the Akhavan Hotel. Thankfully we stayed in the cool Akhavan Hotel in Kerman. The Hotel owner is a top man for helping organise tours and also minimising costs and we managed to fill our car with 4 people for a full day tour. 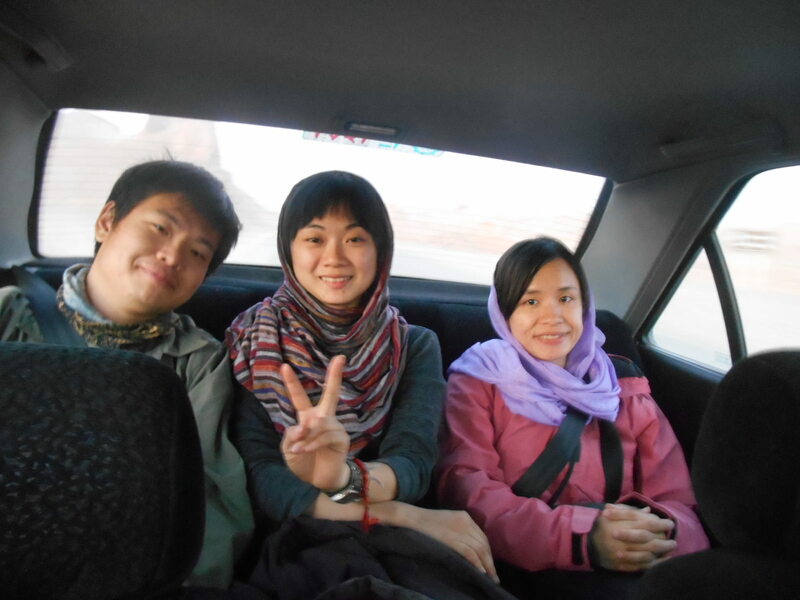 Sean and Ivy from Taiwan – our cool travel buddies for this awesome adventure to Kaluts, Iran. There was myself, my girlfriend and a nice Taiwanese couple, Sean and Ivy all set for a tour which would see us stop at Rayen and Mahan with sunset at Kaluts being the final stop off on the tour. Our group of four touring the Kaluts desert of Iran. 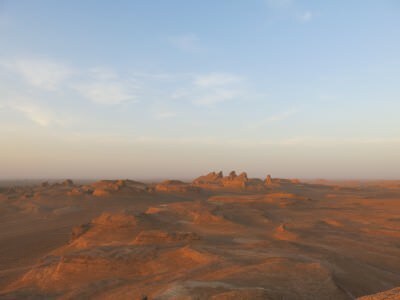 It’s a sandy and muddy desert plain north east of Kerman. It’s an area of little or no vegetation, not much water and is dry most of the year. Yes, you’d expect that – it’s a desert! This massive area has these massive natural rock and mud hills which have odd shapes. You can climb up them and have them all to yourself (or to the 4 of you) as you watch the sunset. Driving to the Kaluts desert in Iran. When to go to Kaluts desert? It’s there all year round of course, but low season is best if you want to avoid the tourist rush. Though in fairness to Iran, it’s still relatively free from masses of tourists and backpackers, so you can go in high season (Summer months) and still love it without masses of other people. 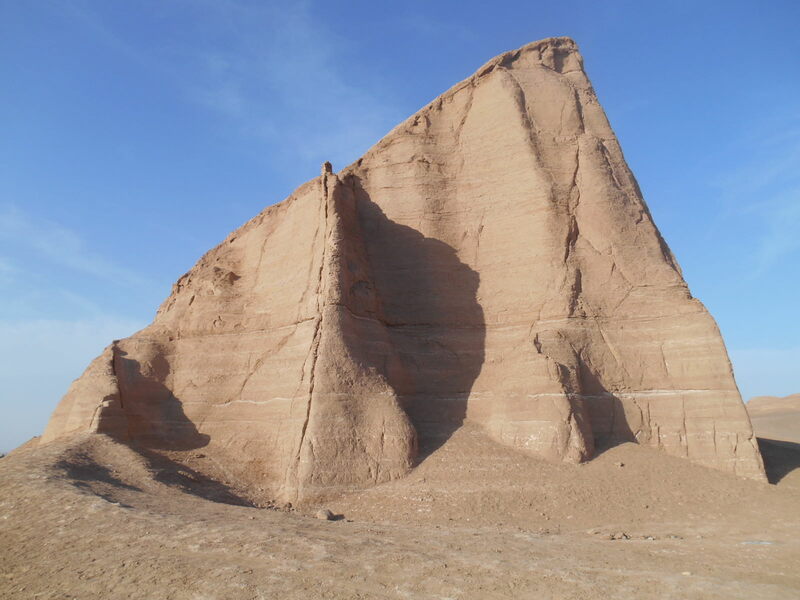 Massive sandy rocks at the Kaluts desert in Iran. How Big is the Kaluts Desert? It’s about 145 kilometres long and 80 kilometres wide. The Kaluts desert is massive!! How do you get to the Kaluts Desert? Hitch hiking is the ultimate cheap option but that sort of thing has passed most of us backpackers by in the heat of a desert. The thrill of hitching a ride by the roadside in Iran doesn’t fit with me anymore, so we got a day tour for $10 US which incorporated the trip to Rayen and Mahan as well. This is good value as your driver will drive you for miles and miles and wait around for you at each stop off point. 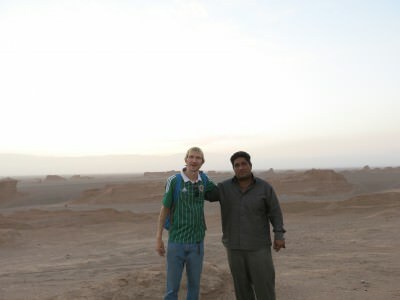 With our driver in the Kaluts Desert of Iran. There is no direct public transport to Kaluts, believe me you wouldn’t want a desert ruined with a bus station or a bus stop. 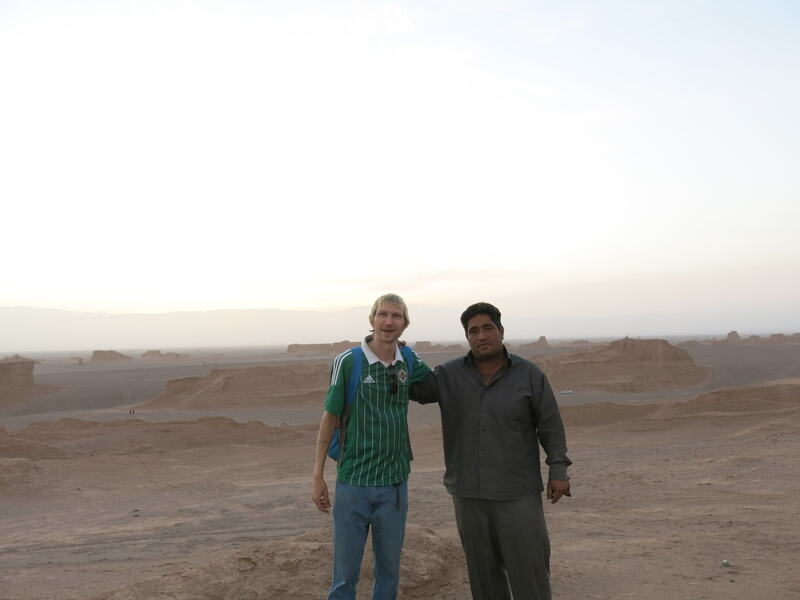 Getting to the village of Shahdad instead and a taxi from there would probably be the cheapest option aside hitch hiking, but we went for the all day tour to get those other two top sites in – Mahan and Rayen. 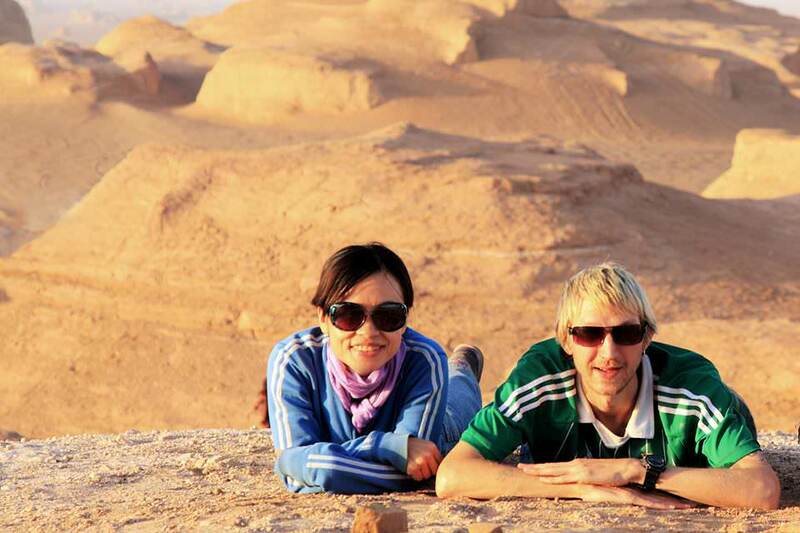 Panny Yu and I at the Kaluts Desert in Iran. What do you do at Kaluts desert? Go walking, relax, soak up the sun, enjoy the views, savour the moment and realise what a dream place this is! As far as sunsets go, the location of this one is quite stunning, so much so that the actual setting of the sun goes a bit un-noticed. As we watched the sunset in a land of desert where you can hear a pin drop, it disappeared below the horizon and suddenly the light had gone. 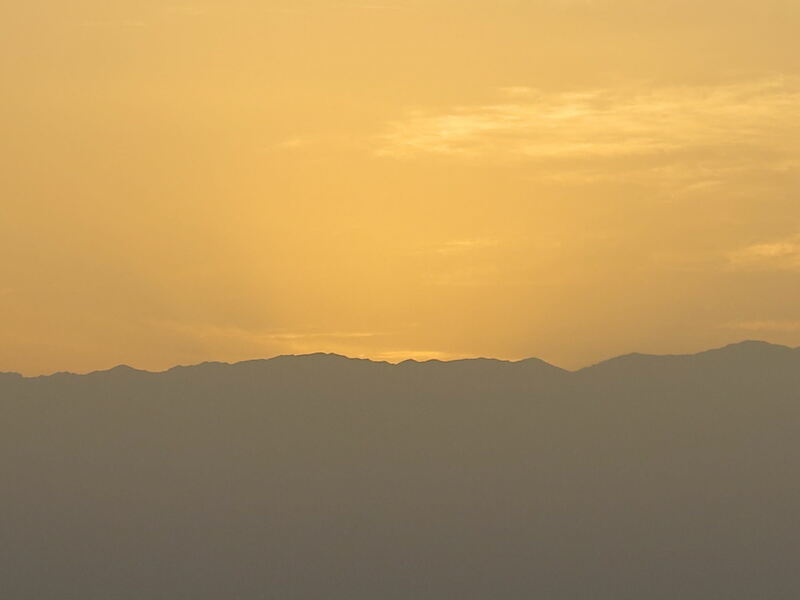 Sunset in the Kaluts desert. Somewhat epic. 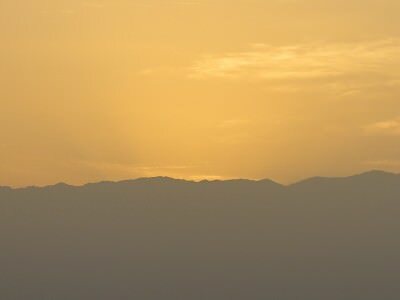 Sunset in the Kaluts Desert, Iran. Can you spend a night in the Kaluts Desert? Yes you can. 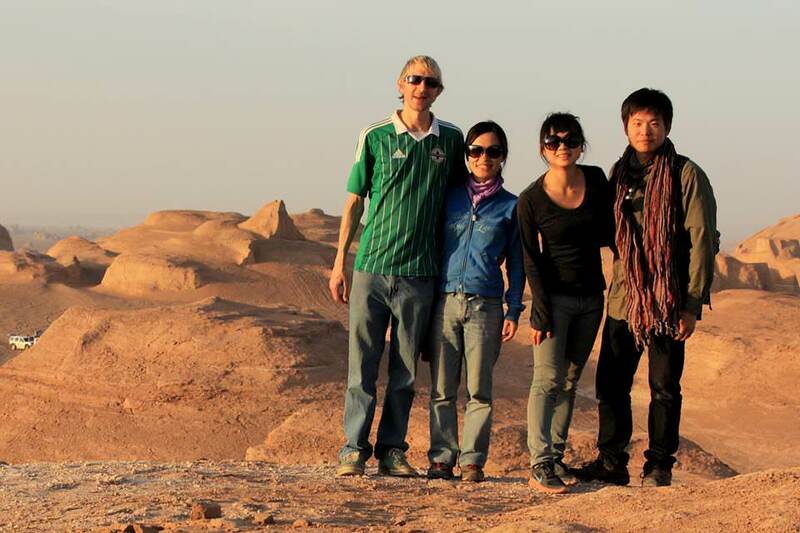 But we didn’t – our desert experiences in Iran would come later in Mesr and Khoor. 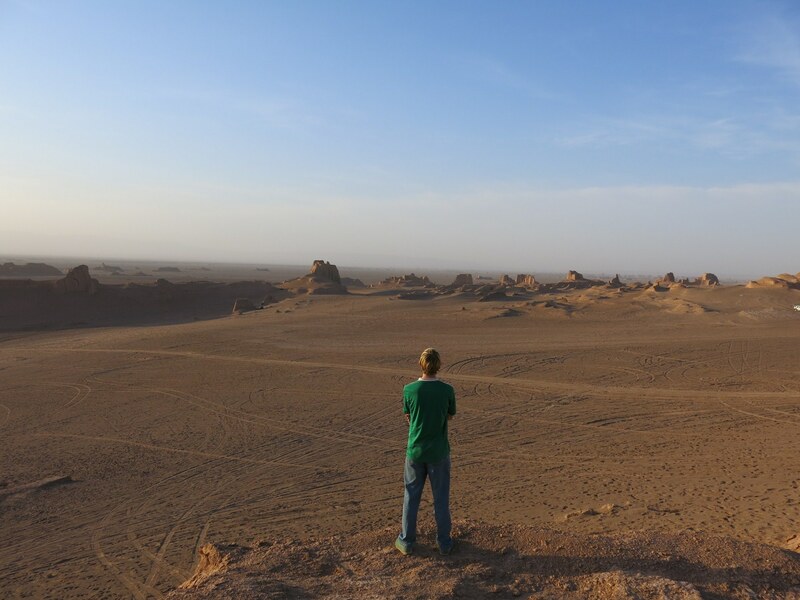 There are rumours that staying overnight in the Kaluts desert is forbidden, but I don’t believe that for a second – nobody would even notice you with the size of this desert!! Loving the freedom of the Kaluts desert, Iran. But if you want to try camping there, be sure to wrap up warm and you’ll need to check for yourself on the feasibility of it during your visit. Certainly staying beneath the stars in the Kaluts desert would be a memorable experience, we did it at Khoor, Mesr and again in other Middle East countries including Jordan. 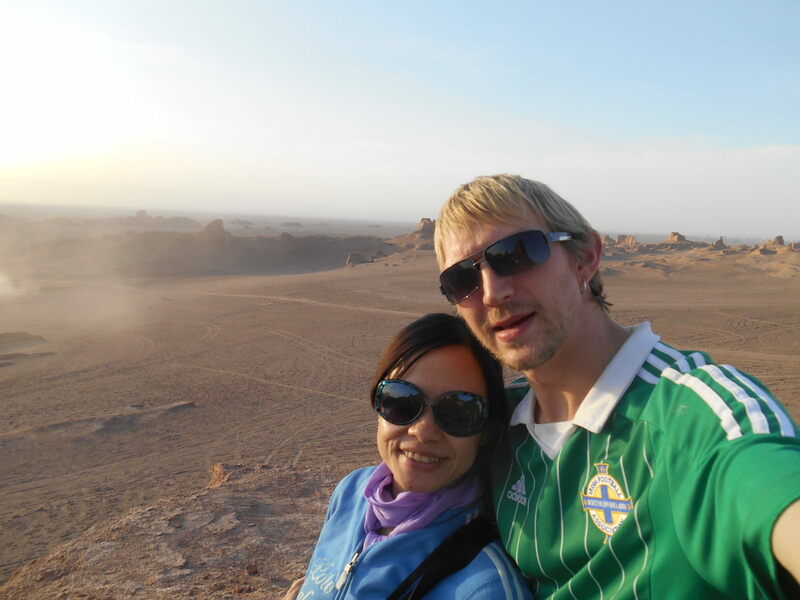 I’m living my travel dreams my friends hoping to inspire you all to the same in ten easy steps. 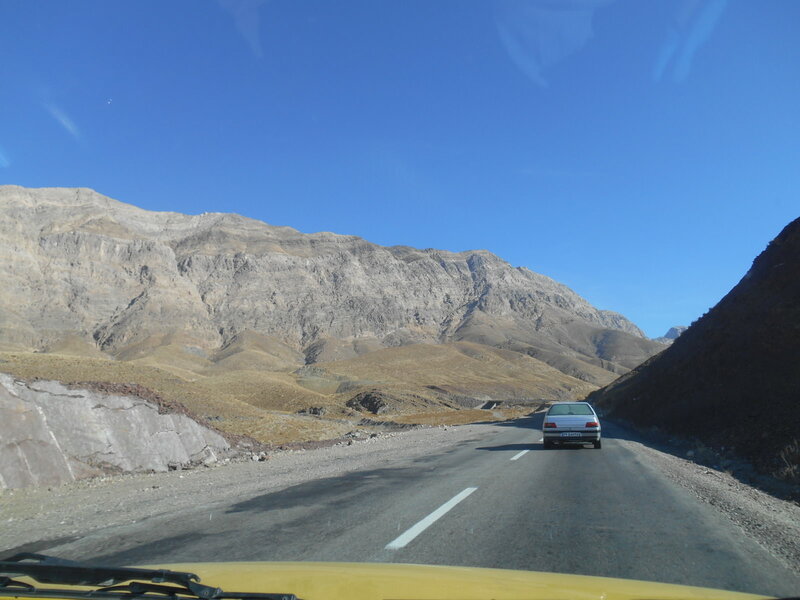 This entry was posted in Central Asia/Middle East, Destinations, Iran, Kaluts. Bookmark the permalink. 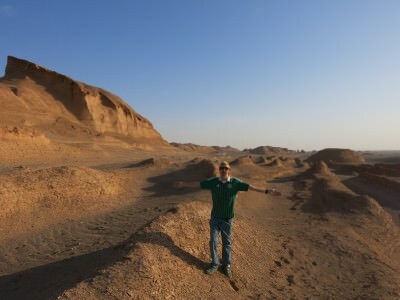 $10 US/person for an all day tour to three locations plus the Kaluts Desert? That is such a steal for a day trip. You weren’t kidding when you said Iran was cheap! 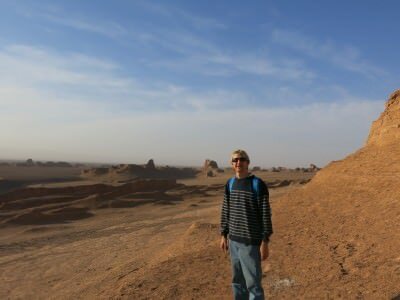 I’m surprised Iran isn’t on a lot more annual “Top 10 Cheapest Backpacking Destinations” lists. In fact, I don’t even recall Lonely Planet even listing it in recent years. I agree it does seem cheap Ray, but when you consider you can get a bus for hundreds of kilometres for about $5 US then it also seems a bit pricey. I guess I’m used to cheap travel these days that anything seems expensive to me and I bargain a lot. If you need to some more information about Iran Deseret , you can refer to following web pages on the Facebook – Iran desert.